This page has information which is not substantiated, and certainly not supported by any vendors mentioned on this page. Any damage sustained to yourself, your equipment, or your data is entirely your own responsibility, and if you break things, whilst I am sympathetic and feel your pain, I am not responsible as in no way am I suggesting this is a good idea. I habitually push boundaries.. there, I’ve got that off my chest. Having recently bought myself some Cheap home datacentre-quality gear, a Supermicro X9DRH-7F, I wanted to pass the onboard LSI 2208 controller to FreeNAS in a VM, to save having to plug in a PCIe expansion board. My prior experience with LSI HBA’s said that it was pretty easy to flash them between RAID and IT mode firmwares, as I’d done it before by Flashing the Dell Perc H310 with an IT firmware. I didn’t even research it before diving in – I just grabbed a boot disk, loaded it up with LSI tools like megarec, megacli, and sas2flash, and got to work backing up the firmware blocks and wiping the BIOS on the card. In the red corner, we have the heavyweight LSI2208, sporting a pair of PowerPC 440 processors at 800MHz, with a x8 PCIe bus, and a 4.8Gb/s SAS-2 core, as well as 4MB of context memory. In the blue corner, we have his slimmed down LSI2308 brother, genetically similar, with the same features, but only a single PowerPC 440-series processor, but at the same 800MHz. The important piece of information is that the LSI2308 *does* have IT mode firmware, and I actually have a couple of HP 220 cards which use that chipset, both of which I’ve flashed to the LSI firmware v20. Given the similarity of the 2208 and 2308, I wondered whether I couldn’t just flash my X9DRH’s onboard broadcom chipset with a generic LSI HBA firmware, and, having already wiped the card, figured I’d give it a shot. This is the point where some of you will think “this guys a fuckwit, why is he risking a really expensive motherboard and functional RAID controller?”. To me its not functional.. I have an ideological dislike of hardware RAID devices, and have a strong preference for software RAID-type solutions, on the basis that a hardware failure can be recovered using generic commodity hardware, as frankly, I’m not a data centre and don’t keep hot-swappable spare parts on the shelf in case of failure. Anywho.. lets get on with it. (/hattip to my in-laws for that word.. there’s something satisfying about saying it like that instead of boring old “anyhow”. The older I get, the more relaxed I am with the concept that language is a fluid beast, and not a set of rules to be enforced by grammar nazi’s who argue over stuff like whether an oxford comma is the right thing to do or not. This is entirely unsupported, and not recommended by anyone. Its here purely as a curiosity, so if you feel compelled to copy these commands and end up bricking something, or suffer any negative outcome, its your problem. I can’t see any support people at any vendor saying “oh? flashing the firmware from a completely different device caused issues? thats unexpected!”. Here’s how I made the above happen, for my own records.. I used 2 USB sticks.. 1 which was DOS bootable with the megarec etc. tools on it (see below to find the link to LSI_DOS.zip with the tools in it), and another which just had the sas2flash.efi file on it to use from EFI shell. I chose “smc” for “Supermicro”, and I stick with the traditional DOS 8.3 filename/extension format. In this file, is the magic line which stores the SAS address of the card – which is globally unique to the card. Good to have it stored in a file, so I can restore it if it gets wiped! Not sure where I got empty.bin from – I have another file called sbrempty.bin which may be the same? Last step is to wipe the flash memory..
Good, it can see the card. There are multiple versions of sas2flash (and sas2flsh.exe). When I flashed my HP220, I had to get the sas2flsh.exe (DOS version) from the old v14 LSI drivers, as the newer sas2flash wouldn’t work. Note you don’t have to flash the bios file (mptsas2.rom) – if you leave it off you’ll get faster boot times, but it does also give some config options. Verify that it can see the card, but you’ll notice the “SAS Address” like is all zero’s – need to reprogram the address which was saved using megacli earlier. I also try to flash the 9267-8i. I’ve gone through all the possibilities, unfortunately none of the FW had worked. I always get error message after sas2flsh (DOS and EFI) command. ERROR: NVDATA Image does not match Controller Chip Revision! Maybe someone knows an advice. I am really intrigued by your guide. I have a 9265-8i which is only a PCIe 2.0 controller. 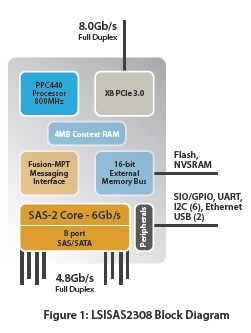 But the SAS2208 on the 9265-8i is spec’d as PCIe 3.0. Do you think this is limited by the hardware on the card or the firmware? 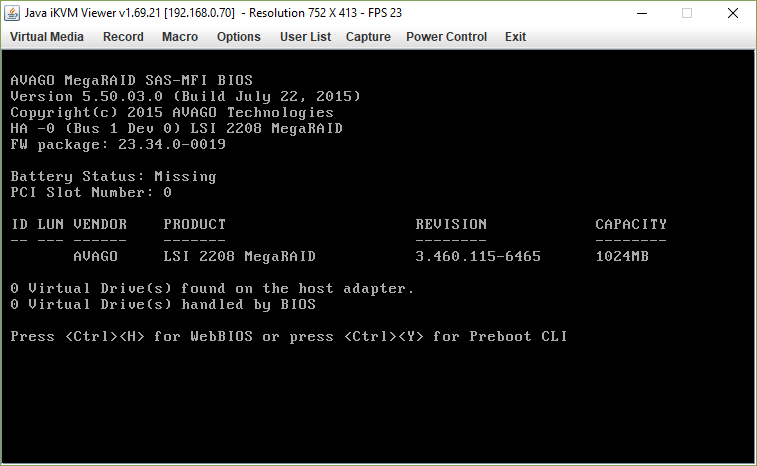 I have read of others flashing sas2208 cards to sas2308 firmware, but all have done as you have to the IT firmware. I want to retain RAID but unlock the PCIe 3.0. Is this just wishful thinking? Hi Hilton, Great write-up and thanks for sharing. Does flashing to IT Firmware allow for the OS to spin the drives down, or does the LSI controller still have priority over this? I’m struggling with a SMC 2208 in JBOD mode, keeping the drives spinning. Thanks for the excellent tutorial – this is just a word of warning for anyone who comes across one of these beasties. I may have a couple things I can try but if anyone has any suggestions I’d be happy for an extra brain. As I suspected, the HDD backplane on this system seems to be the culprit – unplug it and the card initializes without a problem. However, even with the server BIOS updated and the Avago BIOS removed, it still can’t inventory the drives – FreeNAS just seems to go into an infinite loop when that comes up. Will need to see if I can update the backplane itself using Huawei’s Fusion tools – the iMana interface only seems to be able to update itself and the server BIOS. Dude! You are my hero! I know this post is a little old now, but I just started building a homelab. I wound up picking up an X9DRH-7F board in an 8-bay Supermicro chassis. I threw some shucked WD’s in it and could not for the life of me figure out why UnRAID couldn’t see them. Googling led me to your post on Serve which led me to here. I followed your instructions (which are pretty much spot on) – I found the sbempty.bin in one of the downloads and the efi version of sas2flash is sas2flsh.efi but other than that, everything worked just like you wrote. My RoC 2208 is now in IT mode and my drives are currently formatting in UnRAID. Thank you! Thank you! I was able to successfully flash a SuperMicro BPN-ADP-S2208L-H8iR, installed on an X9DRFR motherboard in a F627R3 chassis. 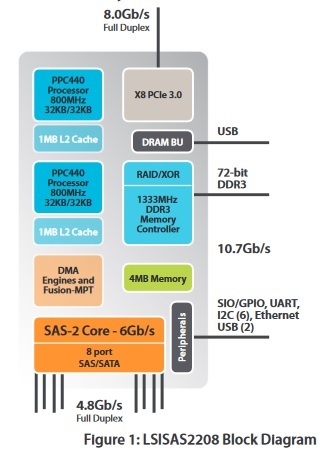 It is now a basic SAS-capable IT HBA. No more “megawebgui” thing, just basic IT capabilities. I have just tried following it through on a X9DRH-7TF motherboard. It appears to have worked, however I think I may be having issues with my backplane (BPN-SAS2-826EL1). When the backplane is disconnected, the system boots fine into FreeNAS, however, if I connect the backplane, Freenas stays at ‘run_interrupt_driven_hooks: still waiting after 60 seconds for xpt_config mps_startup’. 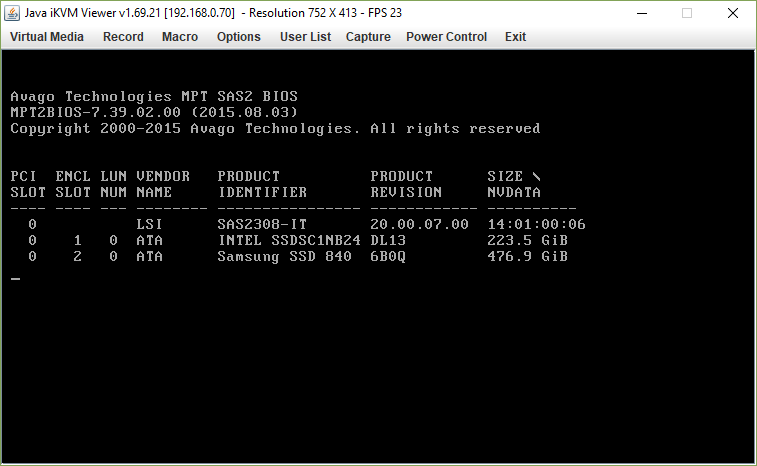 Note: When I flash the MPTSAS2.ROM bios, the system halts on the Avago Bios screen at ‘initializing..’. It will however boot if I disconnect the backplane. Is this problem solved? Is it a backplane problem? thank you. Did you get this resolved? I have the same motherboard and backplane. No, I never resolved it unfortunately. Now using an LSI 2008 HBA in IT mode. Stumbled across this site after I fudged my way through re-flashing my M5110 to be an HBA. Was definitely not a straightforward process, but not really any more difficult than re-flashing an M1015 to IT mode. Your post implies you successfully flashed the M5110 to IT firmware? Good to know, as its also a SAS2208 card, and a useful data point to have on cards which can be flashed. I take it you had no issues with a buzzer being on? It gives me “NVDATA image does not match controller chip revision” error, and cut the operation. Actually I had to use uefi version, but could not find P14 UEFI. Which I download from broadcom web site, P14 file shows version 15 and its file name is sas3flash. I have tried lots of sas2flash versions, non of them worked. What did I miss? Firstly – this flash is deifnitely not an approved one. Not sure what sas3flash is/does? In my experience of flashing LSI cards, the validation of firmware compatibility depends heavily on the binary you’re running to do the flash, rather than the firmware. 1. See if you can find an older version of Intel’s own flash tool/firmware to flash the card back to a much earlier version. Then try the (old) LSI tools from pre-P14 days. 2. Change BIOS mode to be legacy-only, and try DOS tools from P10-era, or in the various lsi zip files you can fond on Servethehome forums. I checked your guide out.